Tomato dosa is a simple food for instant work. Means to make it there is no any efforts .we have to use fewer ingredients & make it. But when small babies are crying for their food habits then we can make it easier. colour is attractive & if we will make it smooth small babies can eat it happily. Every kid wants new something. In my home, my grandson came from Poona yesterday & he is crying for regular food, means he didn’t want to eat chapati & rice so I decided to make a new item for him & start to make it. 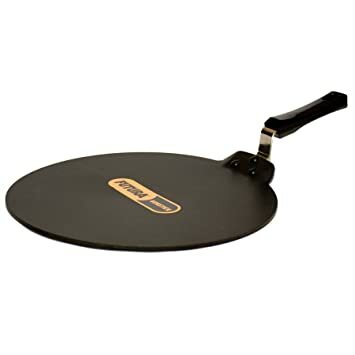 To make it we require branded Tawa, then last week i have demanded it from Amazon.in Just today i want to make an experiment on it. Here it is. You also make an experience of it .just buy now. : Make the paste of it. : Add baking soda, salt into the grinding mixture. : Mix both the mixture perfectly. : Keep the non-stick tawa on the gas. : Pour some oil on it, spread it all over with a spatula or spoon. : Now pour 1 cup of paste on the Tawa & spread it all over. : After some time pour some oil surrounding the dosa. : Turn it to another side with the spatula. : Shake it for a while. : Serve it with Dahi chutney.